A stratified cluster sampling strategy was used to enroll subjects in to the study in two phases: the first in Louisiana in February 2006, the second in Mississippi in August 2006. Using lists of congregate housing sites obtained from FEMA we stratified the lists by type of site (FEMA group sites, commercial trailer sites, and hotels) and by size (1-25, 26-50, 51-100, 101+ residential units). Congregate sites were selected within each substratum using a probability proportional to size strategy without replacement. Overall, twenty-six sites were selected as primary sampling units: twelve FEMA group sites, ten commercial trailer sites, and four hotel sites. In addition to sampling the displaced population living in congregate settings, we supplemented the sample frame in Mississippi with an areal sample. Using FEMA damage assessment maps and databases of the state’s three coastal counties hardest hit by the hurricane, the team randomly selected 150 of 650 census blocks (primary sampling unit clusters) which had been characterized by FEMA as having sustained moderate, extensive or catastrophic damage. This sampling strategy yields a cohort representative of the approximately 50,000 individuals who had been displaced to congregate settings in Louisiana and Mississippi (i.e., trailer parks and hotels) as well as approximately 26,000 people who were living in the most extensively-damaged areas of the Mississippi Gulf Coast, post-Katrina. As illustrated in Table A1, a total of 4,284 households were sampled as secondary sampling units. Nine hundred and eight-five households were deemed ineligible because they were clearly destroyed, vacant, abandoned, or under construction, leaving 3,299 eligible households. Among those, 1,587 households had an eligible adult present to whom the study was presented; at the remaining 1,712 households, no contact was made despite repeated efforts. 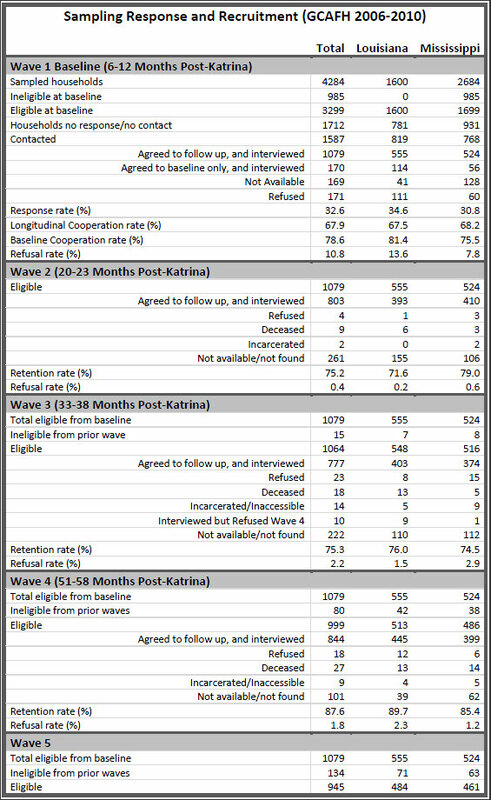 Among the 1,587 contacted households, 1,082 agreed to be enrolled in the longitudinal study, corresponding to a response rate of 32.8% (1,082 / 3,299) and a cooperation rate of 68.1% (1,082 / 1,587). A bias analysis was conducted to identify significant differences between respondents who agreed to be followed longitudinally and those who did not. Individuals who did not report their household income and respondents in Louisiana were statistically less likely to agree to be followed up, and individuals with poor mental health scores were more likely to agree to be followed. No other socio-demographic or displacement factors were statistically significant. An eligible adult respondent was sought at each sampled household who (a) lived at that site, and (b) was the “primary caregiver,” someone who could knowledgably report upon the health issues of all the individuals in the household. Upon enrollment and completion of the baseline interview, respondents received small gifts for adults and children, valued at approximately $15 per household. At the first follow-up interview, respondents received a $30 gift card and at the second follow-up interview they received a $35 gift card. A verbal informed consent was acquired from respondents at the first two interview rounds and a written informed consent was obtained at the last interview round. At baseline, selected data were collected on all household members (e.g., age, gender, relationship to respondent, school attendance, chronic health conditions). In addition, a Kish sampling strategy was used to randomly select one child in the household for more detailed questions. Domains of interest included pediatric and adult health status; the prevalence of chronic medical conditions among sampled households; access to health care and services, including health insurance coverage; primary medical, specialty, and dental care needs among sampled children; the prevalence of behavioral conditions and learning disabilities among children; household characteristics such as social and economic resources; social service needs; a brief history of the residents’ displacement after the hurricanes; and the demographics of the displaced population. The first follow-up survey, G-CAFH Wave 2, was conducted as a telephone interview between 20 – 23 months after Hurricane Katrina. The survey instrument repeated baseline measures and added measures of social support networks, self-efficacy and locus of control, community engagement (pre- and post-Katrina), and attitudes towards police and criminal justice systems. Among the 1,082 respondents eligible for follow-up, 8 had died and 803 were found and interviewed, for a 75.1% follow-up rate. A bias analysis revealed that the factors most associated with attrition were the absence of a working telephone and having lived at a trailer park that closed down in between the baseline and follow-up interviews. Socio-demographic characteristics such as race/ethnicity, income, age, housing situation, or state of residence were not independently associated with follow-up attrition. A second follow-up survey, G-CAFH Wave 3, was conducted as an in-person survey between June – August 2008, and was suspended when Hurricane Gustav was imminent. As with earlier survey instruments, the Wave 3 survey included repeated measures that captured health access and service utilization, mental health, child health and social networks, and included validated measures of a “sense of community,” self-efficacy, and post-traumatic growth. Twenty-four community-based interviewers in Louisiana and Mississippi were recruited and trained, and a field office was established at the Louisiana State University School of Public Health to coordinate the field work. When the field effort was suspended in the last week of August, 718 among the 1,055 eligible respondents in the cohort had completed the survey. Six weeks after the hurricane had passed, the field team resumed data collection for a brief three-week period, interviewing an additional 59 respondents. The completed round of data collection thus encompassed 777 individuals. As illustrated in Table A1, we retained 74.5% of respondents in this round. Only 14 people refused to participate, for a 1.9% refusal rate. The G-CAFH Gustav Supplement was conducted as a telephone interview between Sep. 25 – Oct. 13, 2009. Eligible respondents for this supplemental survey included the 718 participants who had completed G-CAFH Wave 3 prior to Hurricane Gustav’s landfall. Among those eligible for the supplement, 528 completed the interview, a 73.5% retention rate. The survey instrument for the G-CAFH Gustav Supplement was divided in to six sections: (1) Evacuation, Event Response, and Return; (2) Recovery Impact; (3) Adult Emotional Impact; (4) Child Emotional Impact; (5) Child Medical Impact; and (6) Adult Medical Impact. Validated scales and measures were used wherever feasible, including the Medical Outcome Study’s Short Form-12 (SF 12 v2), among whose scales is the mental health component summary score (MCS), a well-regarded measure of mental health distress and disability, as well as the Trauma Screening Questionnaire, a ten-item scale highly correlated with Post-Traumatic Stress Disorder symptoms. The survey was conducted by trained interviewers as a telephone interview, and required 15 – 25 minutes to administer. Respondents completing the survey received a $20 WalMart gift card. The survey and consent process was reviewed and approved by the Columbia University Medical Center Institutional Review Board (IRB protocol AAAB-8668).